A typical Brazilian breakfast consists of fresh crusty rolls and thick, sweet coffee. (Fruit and sliced ham and cheese are optional.) Brazilians are intrigued by the huge breakfasts they see in American movies and often ask us if we really eat ham, eggs, waffles and cereal every day. This gives us a perfect opportunity to invite them over for one of Dan’s famous pancake breakfasts. In fact, since we moved to Brasília, we’ve had company almost every Saturday morning. Last Saturday we received a phone call from two young men from our Luziania FMC (an hour away) saying they were catching a bus to come spend the day with us. When they arrived at about ten, Dan was putting plates of piled up flapjacks on the table. Soon we were joined by three other young people from the Aguas Claras church plant. Juice, syrup and laughter flowed as the sausages and pancakes disappeared. Afterwards Dan led us in a short devotional time. He read from Exodus 40 on the tabernacle utensils (not exactly one of the most exciting passages in scripture). It was a joy to see each young man and woman jump into the discussion. Each one recognized that just as the tabernacle was the geographic center of the Israelite camp, so the Lord must be the center of our lives. When the party broke up at about 1 o’clock we felt nourished physically, emotionally and spiritually. Praise the Lord for all the ways He feeds us. Flapjacks–what a great cultural bridge! Thanks, Beth. It’s not coincidental that in 9 of the 11 post-resurrection appearances of Jesus He was feeding or eating with his disciples. We need to do more of this. And then of course work and sweat hard together in order to keep the weight off! uum pancakes! Looks good. However, I would like the Brazilian breakfast, too. I eat a lot of odd things for breakfast. I especially like kippers. What a gorgeous, yummy stack of pancakes! 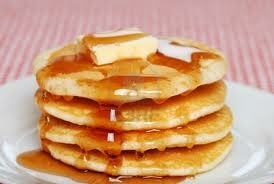 Tell Dan I would love for him to make pancakes next time you are at my house! Can’t help it..I have a question. I am gluten sensitive. Do you have this problem in your country? More and more people here in the USA are realizing their own problem with gluten. Pancakes are soo good, and I do miss their goodness since it is hard, if not impossible to come by GF pancakes. Hello Fran! Brazilians don’t seem to have as many allergies as Americans do. Maybe because they eat very little processed foods? I don’t really know. I have noticed a lot of gluten-free recipes on facebook so I’m glad some alternatives are being found in the States for those who are gluten sensitive. Still, I’m sure it’s a hassle sometimes.